The course enables you to bring more value to your M&A clients. Black Duck's On-Demand business continues substantial growth from year to year despite some fluctuation in M&A deal volume. The open source question is now asked in the great majority of transactions involving software assets and audits are becoming almost the norm. As market leader in M&A audits (as well as internal governance solutions) over 1,000 companies rely on Black Duck products and services to analyze their code and identify unapproved open source or other software policy violations. While Black Duck analysis helps establish the facts related to software licensing and compliance, our customers need legal assistance to guide their policy and remediation decisions. 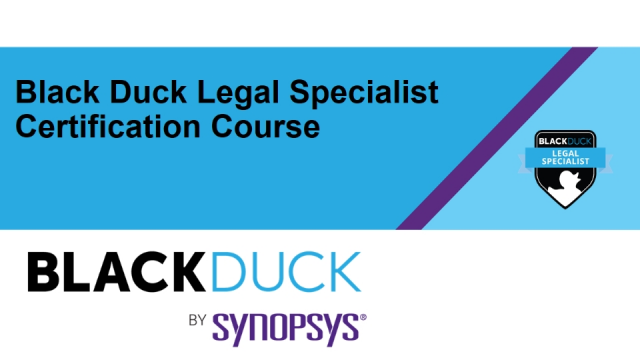 The Black Duck Legal Specialist Certification identifies an elite group of legal professionals who can effectively partner with Black Duck's rapidly growing assessment team to provide these services. You will leave with the knowledge and skills to bring more value to your clients and a relationship with Black Duck designed to secure preferential treatment for them. While the course is geared towards firms advising clients in the context of M&A due diligence, we've had a number of in-house counsel participate and find it valuable as well.